Not long ago I was talking with a class of library science students and someone asked why we should repair books rather than discard damaged books and replace them. After discussion, the students generally agreed that, due to the cost of new books and how quickly publishers seem to take them out of print, repair is often the best alternative. Our experience at Demco bears this out as we continue to see a strong interest in learning about the techniques and tools of book repair. And so we move on to continue our discussion of ways to repair torn paper. In the latter part of The Book Doctor is In: Book Repair ASAP, we talked about reattaching pages that have been torn out of books and why attempting this with a pressure sensitive tape almost invariably results in a poor repair job. 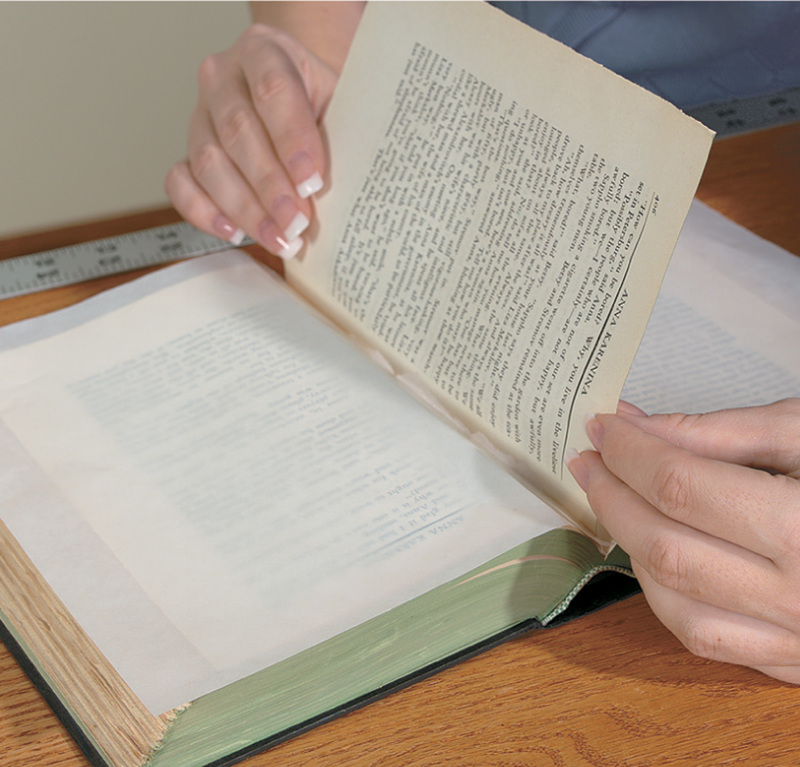 Using Norbond® Liquid Plastic Adhesive to reattach a page works well when the page has a flat, smooth edge that can be reinserted deep into the gutter of the book. 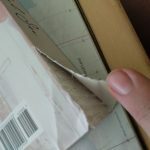 However, when pages have been physically torn from a book such that a neat edge no longer exists, the repair will be somewhat more complicated. Usually a portion of the page remains in the book and you may be tempted to simply use an ordinary pressure-sensitive tape to reattach the torn-out page to the remnant of the page still in the book. Don’t do it! It is very difficult when using a sticky tape to accurately fit the two sides of the tear together perfectly and the taped area will be much less flexible than the rest of the page so a new tear will quickly develop along the edge of the tape. 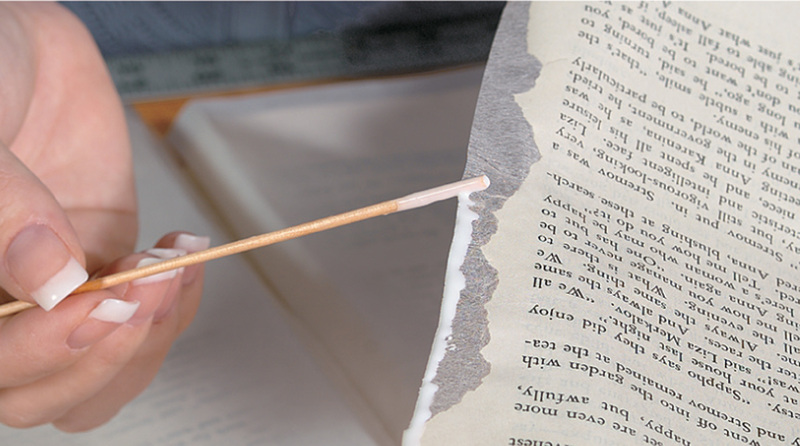 The best way to reattach a page that has been completely torn out of a book and has a ragged edge is to “rebuild” that edge using a transparent tissue, such as Book Repair Tissue, and Norbond® Liquid Plastic Adhesive. As shown in the photo below (Step 1), the tissue can be torn to fit along the edge of the page and attached by brushing the Norbond onto the tissue. Cover that with waxed paper, place some weight on it, and allow it to dry overnight. 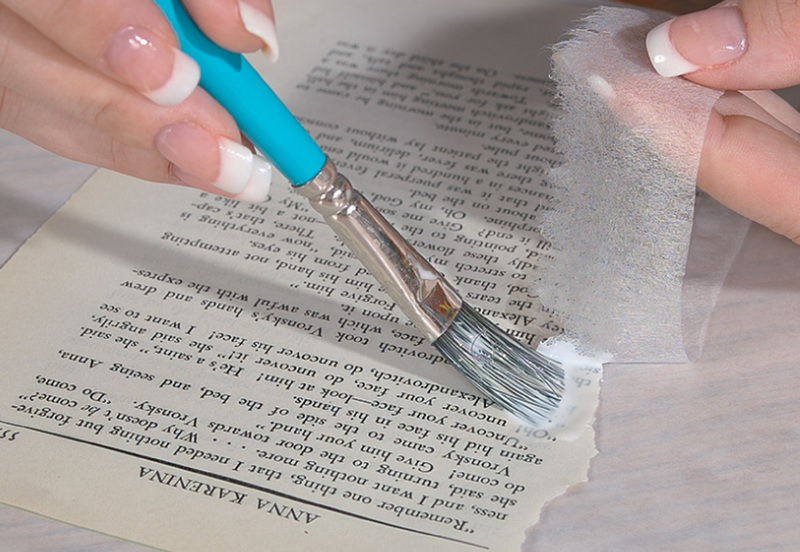 After the adhesive in the first step has dried, simply apply fresh adhesive along the edge of the tissue and insert it deeply into the gutter of the book. Be sure to place a sheet of waxed paper on each side of the repair before closing the book and allowing it to dry overnight under some weight or wrapped with rubber bands. 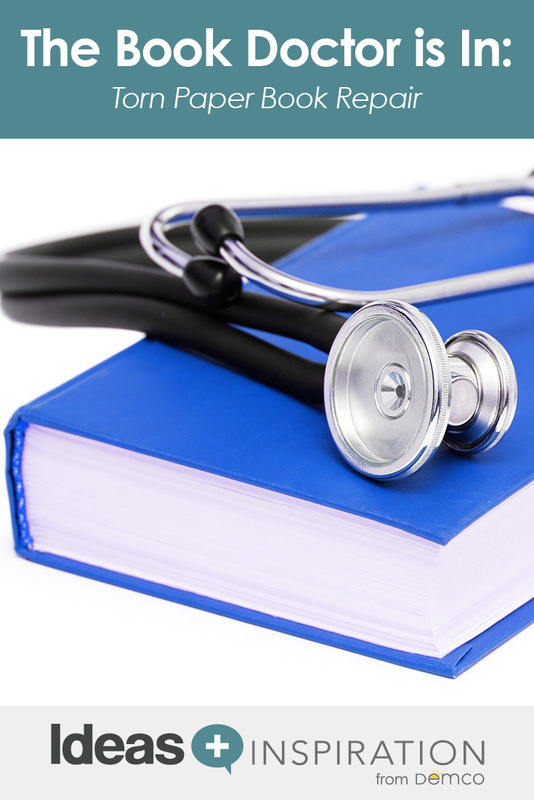 As we mentioned in The Book Doctor is In: Introduction to Book Repair, a great many decisions in book repair are based on judgment calls. 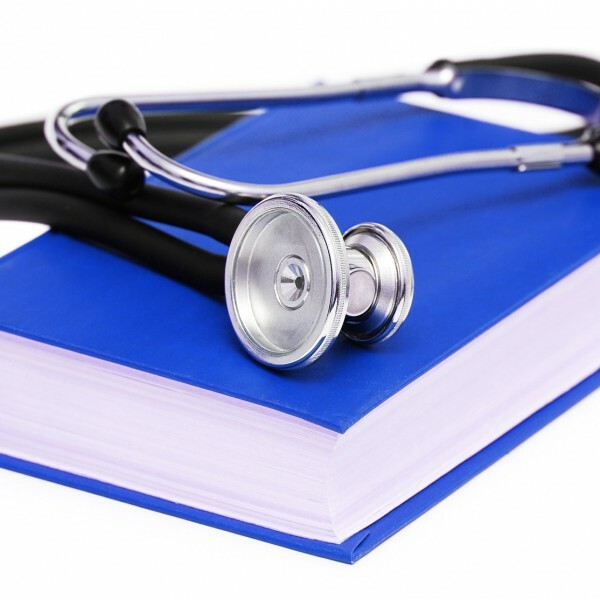 It’s a judgment call as to whether or not the book should be repaired and returned to use and it’s a judgment call about the amount of time and materials you can devote to a repair. When it comes to “extensive tears” and what that means to you, that’s also a judgment call. If you’re confident that you can mend a torn page and get a professional quality repair, then go for it. If the tear is very long, or ragged or zig-zaggy, then you’ll be better off taking more time to follow the procedures outlined here. Filmoplast® P Paper Mending Tape provides the quickest and easiest repair that I have found for badly torn paper. (I don’t recommend Filmoplast® P-90 Tape for page repairs because it is opaque white and covers the print.) Filmoplast P is a very strong transparent tape that is flexible so the book paper will not fatigue and tear again. Additionally, the adhesive is not so aggressive that you can’t lift the tape a bit to make adjustments if necessary. We said it before, but it bears repeating, make certain that the two sides of the tear are aligned and overlap correctly. Apply the tape starting at the base of the tear and carefully smooth it to the edge of the page. Wrapping 1/2″ or so of tape over to the reverse side is a good idea. Start at the center of the tear and work out to one edge and repeat for the remainder of the tear. Use a plastic folder to smooth the repair and ensure the tape is secure. Don’t have access to Filmoplast P tape? A satisfactory alternative to repair an extensive tear is to use Book Repair Tissue and Norbond® Liquid Plastic Adhesive. Tear a section of the tissue wide enough and long enough to cover the tear. Brush Norbond on one side of the tissue, make certain the two sides of the tear are aligned correctly, and gently apply the tissue over the tear. Place a clean piece of waxed paper over the tissue and then use a plastic folder to firmly smooth the repair. Place some weight on the repaired area and allow it to dry overnight. You’re about to graduate to the next level of book repair! From this point forward in this series, we’ll be dealing with more difficult repairs. To help you get ready to level up, next month we will review the physical parts of a book and how they all work together. After that we’ll move on to more difficult repairs. What are your book repair questions and concerns? Post your comments below and I’ll respond. I may use your input in future posts to help you take the best care of your collection. I have torn pages in a book. About 10 with jagged edges. I would like an estimate for repair. I’m on a limited budget and really like the book. Thanks. This is a simple repair that you can do on your own. 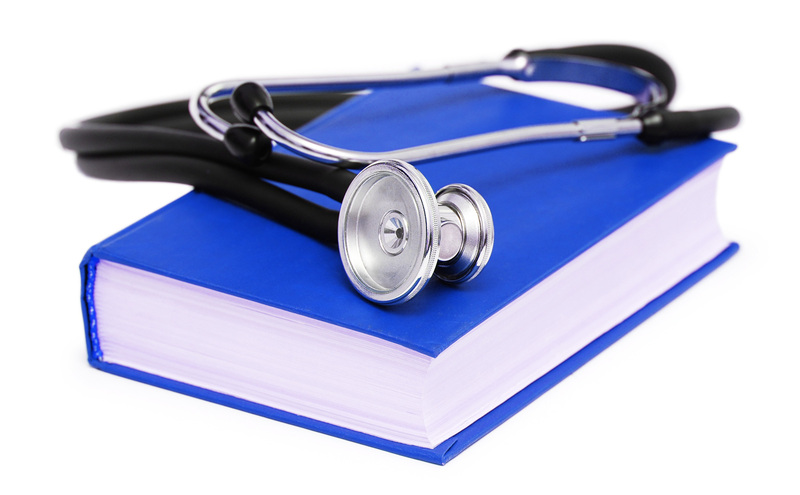 Please refer to “Book Repair ASAP” which deals with repairing a torn page. The first suggestion there is to use high quality tape such as Scotch Magic Mending Tape but I would be hesitant to use tape to repair 10 pages since that would result in a very thick area in the book. Instead, refer to the next section headed “Alternative to Taping a Tear” and follow that process. So please can you tell me where can i get wax paper? Thanks. Pre-cut sheets are available from Demco. Shop for product #WS20031930. It’s heavily coated so each sheet can be used many times to protect your books as you repair them. Hi John, this was very helpful, you just saved so many of my books you have no idea. 🙂 I also wanted to know how to repair other pages such as certificates? My cat tore a corner from two of my a level certificates and I’m not sure I should use scotch tape on top since that makes it very obvious, and like you said, can ruin more than it can fix, and the torn corners are slightly smaller than two fingertips together. What should I do? Thank you. Sorry about the damage to your certificates. 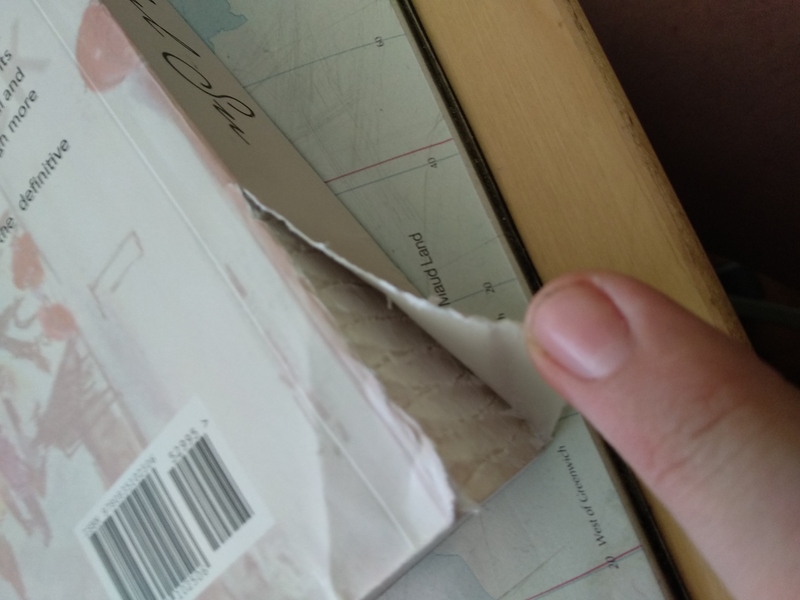 You are correct that taping on the front surface would be fairly noticeable so I would suggest that you use a procedure from the June, 2015 blog “Book Repair ASAP”. The “alternative” method, using Norbond adhesive, would probably result in the least noticeable repair but you could also follow the process in the section on taping a torn page but place the tape on the back side of the certificate. Just be careful that the two sides of the tear overlap correctly. Please forgive me for being so tardy with this response. I found today that I had written it but neglected to post it. is the Norbond adhesive reversible? Are these methods what you would recommend on a rare or hard to replace book/document? In case you are dealing with badly torn paper you can follow the procedures outlined in this blog post but substitute a starch paste for the Norbond to make a reversible repair. I hope this helps but if you need further information don’t hesitate to send a follow-up question. I was wondering if these methods for repairing paper could also be used to repair older collectible trading cards or post cards and such. I have some baseball cards for instance that were damaged. A few were torn partially, another was torn in half, and a couple lost the corners. I’m just curious if there’s a way to repair them again and if so would it follow similar methods as other paper products or is it an entirely different animal altogether? How you repair collectable cards depends on what you might want to do with them. If you are planning to keep them for your personal collection with no intent to sell them in the future, the techniques discussed in this blog are acceptable. Just be sure that you are using acid-neutral products for the repair such as Filmoplast P transparent mending tape and NeutralBond adhesive. However, if you find cards that may have significant value in the collectibles market you have many things to consider before making any repairs as a poorly-done repair can render a valuable card unmarketable. Even a professional repair can reduce the value to that of an unrepaired card. There are many on-line resources you can consult to research the potential value of your cards and organizations that will appraise individual cards that might have value. My best advice is to proceed thoughtfully and carefully before making any repairs to older cards and it you decide to repair use materials that will not cause additional damage. I have a soft cover book, please see the attached pictures. The spine seems to be torn, however the pages are all intact. What is the best course of action. By this way, I have never repaired books, save for taping them.